In the oddly structured M's first sequence, the lower-class residents must contend with the anonymous killer while still embroiled in the worldwide economic depression. Lang's pioneering use of sound is most prominent in this part, which presents one of the earliest instances of sound from one scene overlapping onto another different scene as a form of transition. One also learns to associate the leitmotif of Peer Gynt's "In the Hall of the Mountain King" with the mysterious murderer who obsessively whistles it whenever he stalks a young victim. The aural atmospherics of this segment do the most to set the tone for this grim film. After the culmination of this part with another child's disappearance and the subsequent murder, the second sequence tracks the police's crackdown on the underworld and the criminal element's response to this escalation. Lang compares the two not-so-different sides of the law using some nifty editing to draw the parallels between them. At times, the match-cutting between the criminal's smoky card table and the cops' smoky meeting room is so seamless one becomes confused as to who is who. It isn't until the third chapter—nearly one hour in—that we really get familiar with the killer in question, Hans Beckert, played by famed character actor Peter Lorre (Casablanca) as a deviant with an irresistible compulsion to prey on small innocents. M most overtly displays its heritage as a transition between two film movements, expressionism and noir, in this part. The heightened reality of the shadowy world of thieves and lechers is amplified considerably by the dark settings and contrasting pools of light that bathe the environs of Berlin's backalleys. Here, the underworld bosses start putting pressure on the stalker by utilizing the guild of beggars, a clever conceit which allows Lang to bring in the city's outliers. Lang's examination of all of Berlin's societal strata is all the more interesting because it takes place only a few years before the Nazis' rise to prominence would change the economic and political landscape of Germany. Lorre's controversial performance takes shape in the film's fourth and final act. Cornered by the criminal element whose activities he has disrupted, Beckert pleads for his life in a large underground meeting hall before a kangaroo court made up of nearly every element of society he's impacted (the exception being that of the law). Victims' mothers, hoodlums, robber barons and their ilk all confront Beckert with the enormity of his crimes while he must defend his actions by sympathetically acknowledging his lack of control over his heinous acts. M has been carefully produced with high definition viewing in mind. A documentary on the physical history of this influential classic follows it throughout its checkered history, demonstrating how badly its been framed in past incarnations before its most recent digital transfer restored it to its true pillar-boxed glory. As usual, Criterion's wealth of extras sates the cravings of film buffs while still entertaining the casual movie lover. Among other features, the most notable are an interview with Lang conducted by director William Friedkin (French Connection) in the mid-seventies, a short tribute film by Claude Chabrol, and best of all, audio recordings of editor Paul Falkenberg discussing the film scene by scene with NYU students and the long-lost English-language version of the film with an alternate (though inferior) ending to the film. 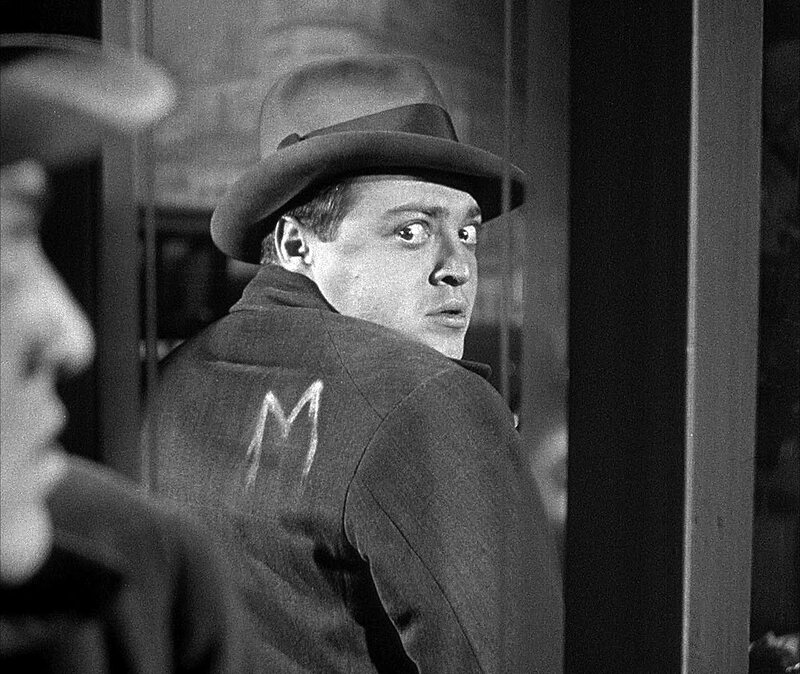 Today's release of M is another reminder of director Fritz Lang's continued influence on cinema today. Tony - as always, great insight into the film. One question: is the new HD version just a transfer of the previous Criterion DVD, or have they done even more restoration to the film itself? I wasn't 100% sure based on your thoughts and was debating whether the ol' "double-dip" was worth it. Oh no, it's a new transfer. As you'll see in the documentary explaining the physical history of the film, the original print used in Criterion's first transfer of M had been misframed for years causing a strange white line to often appear near the top of the frame when framed properly. This is but one of the defects the new transfer addresses. Consider me sold - off to the store post-haste!